When did you first discover your love for gaming? I’ve been in love with gaming since early childhood. I could barely read at the time, but had already spent hours playing NES console. I love games since they give us a wide array of experiences from multiple perspectives. I also learned a lot from all the games I’ve played so far, whether it’s direct knowledge, such as language, science and history, or life lessons. 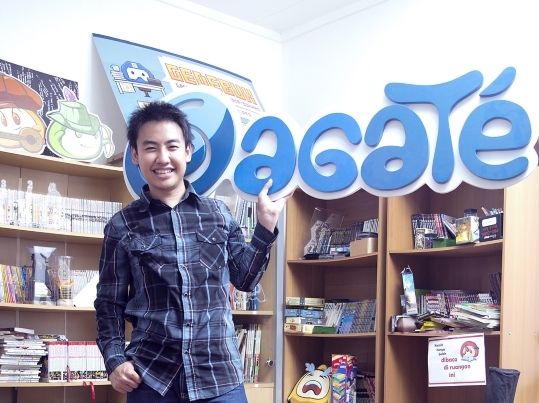 How did you turn from a hobby gamer to the CEO of Agate Studio? I started to become more involved in the creative industry and in game development as early as my elementary school years. I made some board games, comics, and also created some games using amateur-ready game-making tools such as the RPG maker. And I pursued my passion in game development by following programming competitions in high school. During my college years, I applied to study computer science. In the end, I made lots of friends that shared the same passion about game development, and we decided to start our new venture together – that’s how Agate was born. Somehow everyone agreed to appoint me as the CEO – maybe because I love to read business books. Why were you interested in becoming a partner for the Game Mixer project of the German Season? Currently, the Indonesian gaming industry is still lacking compared to other countries, especially Germany. Germany has a very strong gaming industry – a lot of major publishers and developers are from Germany. We always believe that the growth of the industry plays a major part in every developer’s success. We saw that this Game Mixer project is a great opportunity for Indonesia’s gaming industry to learn, exchange knowledge, and build partnerships from the more mature German gaming industry. So we’re more than happy to be able to support the German Season and become a partner. How has the gaming scene in Indonesia changed in recent years? It’s becoming really interesting now – more and more new players are entering the industry, lots of ventures get more funding, which at the same time means more capital in the industry, and the quality of the games developed in Indonesia has increased a lot. The market also grows tremendously, especially because of the smartphone penetration. Our market, according to a research by Newzoo, is worth around USD 160 million, and the growth predicted could be 15-30% yearly.